All numbers herein are approximate. “The New York of Asia” someone said to me. Yeah, right. New York by itself is a mere 8 million souls. You need to include New York–Newark, New York–New Jersey–Connecticut–Pennsylvania Combined Statistical Area to equal Shanghai. Shanghai is immense. According to one piece of research, it’s THE biggest “proper” city of all time. Oh yeah? Wanna play big? Check China out. The Daddy is the Ghuangzhou built up area weighing in at around 44 million. And you think it’s busy queuing at the checkouts of Morrisons on a Friday… So 60% of the human live in Asia. 1 in 5 of us on the planet are Chinese. So in our family there’s me, Mrs Beer, Ms Beer, Master Beer and Granny Feung-Shui-Chiu. I think Mrs Beer is the Chinese one. It’s easy to become dazzled by the numbers here. The Metro is dazzlingly cheap, clean and – my Great Aunt Mable! – dazzlingly BUSY. The standard (wide) gauge trains are packed to the gunnels with commuters. The trains are around 2 X the length of your longest (London) Tube and much more spacious. At least I imagine so without their seething yet well-mannered human cargo. In terms of human (relative) scale you don’t feel like a monster at 5’11”. The Chinese are not a race of uniformly small folk. Isn’t it funny how lazy stereotypes remain true in your mind? I gave up counting the number of skyscrapers. Although to be fair, the cloud and smog was hampering efforts. One dreads to even consider the power, drainage, water supply considerat ions for a conurbation of such magnitude. 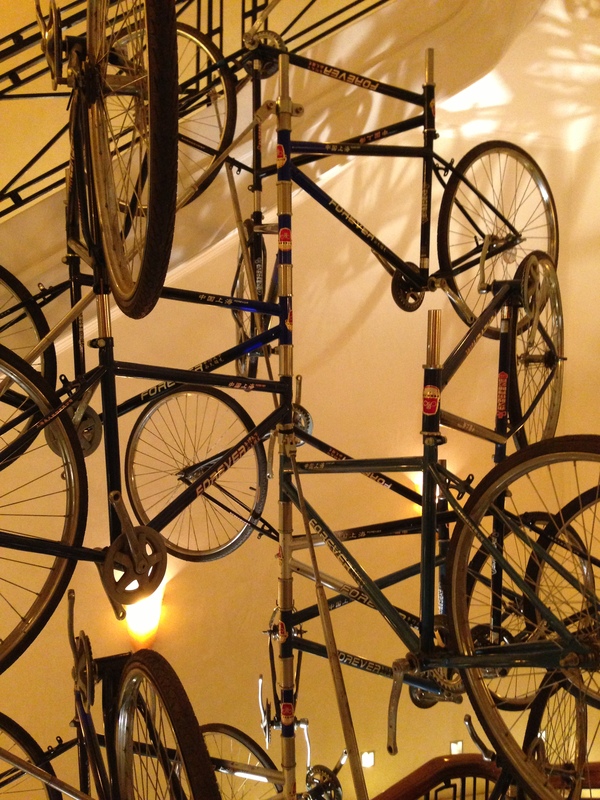 According to Katie Melua, there are nine million bicycles in Beijing. (The inspiration came during a visit to with her manager Mike Batt who wrote the song two weeks later.) 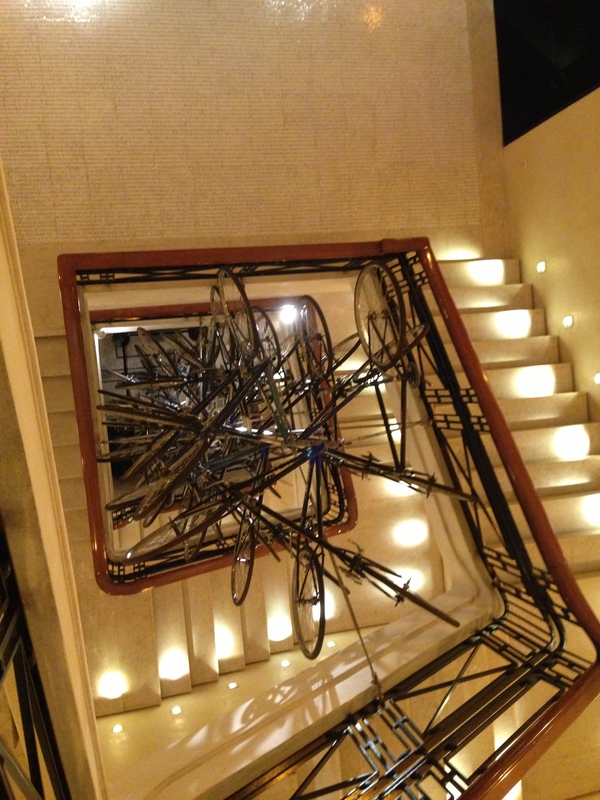 Well, the most bicycles in Shanghai I saw were in a wonderful installation at No7 The Bund. The view from the rooftop bar was of a grand scale too. The price of beer? Off the scale. It’s not cheap here. Not at all. One-to-one scale pricing with, say, London. Now there’s a stereotype that is outmoded. The sheer amount of money in this town, this country is of a scale beyond my Welsh comprehension. And that’s just in one town. But then again it’s a small world.